This 2019 Volkswagen Passat 2.0T Wolfsburg Edition will sell fast! This Passat has many valuable options! Bluetooth Connectivity. Satellite radio. Aux. Audio Input. -Front Wheel Drive -Security System -Keyless Entry -Steering Wheel Controls -Leather Steering Wheel -Automatic Transmission On top of that, it has many safety features! -Traction Control Save money at the pump, knowing this Volkswagen Passat gets 36.0/25.0 MPG! Call Scott Volkswagen at (855) 611-7323 to confirm availability and schedule a no-obligation test drive! We are located at 777 Taunton Ave, East Providence, RI 02914. 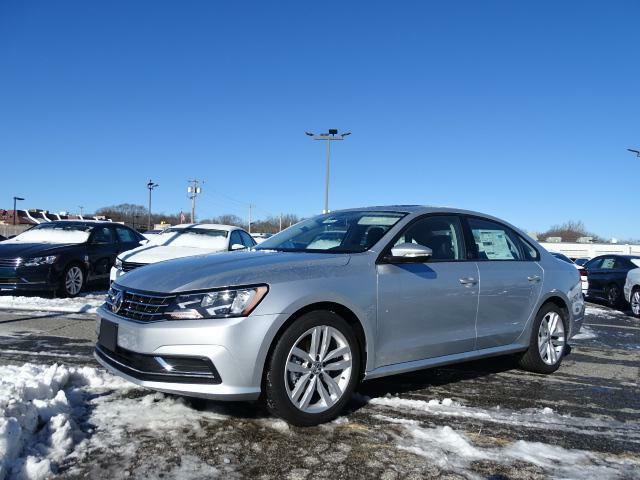 -Great Gas Mileage- *Bluetooth* This 2019 Volkswagen Passat 2.0T Wolfsburg Edition is Deep Black Pearl Effect with a Titan Black interior. This Volkswagen Passat 2.0T Wolfsburg Edition comes with great features including: Bluetooth, Satellite Radio, Keyless Entry, and Tire Pressure Monitors . It is rated at 36.0 MPG on the highway which is fantastic! Buy with confidence knowing Scott Volkswagen has been exceeding customer expectations for many years and will always provide customers with a great value! -Great Gas Mileage- *Bluetooth* This 2019 Volkswagen Passat 2.0T Wolfsburg Edition is Pure White with a Cornsilk Beige interior. This Volkswagen Passat 2.0T Wolfsburg Edition comes with great features including: Bluetooth, Satellite Radio, Keyless Entry, and Tire Pressure Monitors . It is rated at 36.0 MPG on the highway which is fantastic! Buy with confidence knowing Scott Volkswagen has been exceeding customer expectations for many years and will always provide customers with a great value! -Great Gas Mileage- *Bluetooth* This 2019 Volkswagen Passat 2.0T Wolfsburg Edition is Pure White with a Titan Black interior. This Volkswagen Passat 2.0T Wolfsburg Edition comes with great features including: Bluetooth, Satellite Radio, Keyless Entry, and Tire Pressure Monitors . It is rated at 36.0 MPG on the highway which is fantastic! Buy with confidence knowing Scott Volkswagen has been exceeding customer expectations for many years and will always provide customers with a great value!